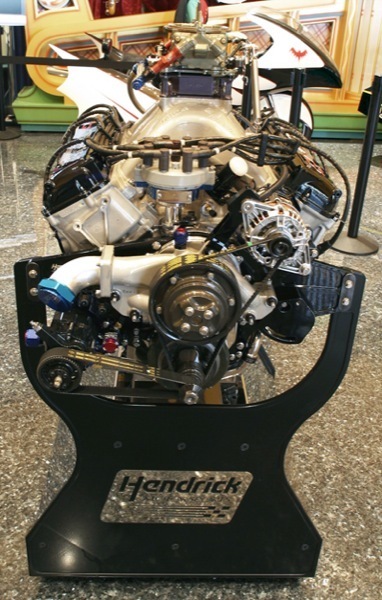 Thank you Rick Hendrick for The R07 engine, the Newest Generation of Nascar power plants. 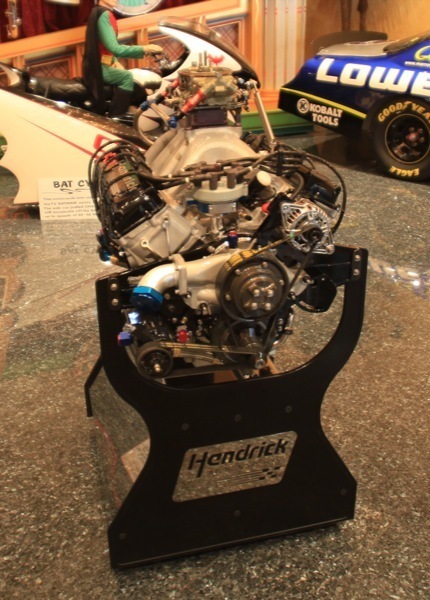 Mr. Hendrick built the motor specifically for Mr. Staluppi, as a gift to be displayed in The Cars of Dreams Museum, helping to attract supporters for the many charity fundraisers held there. 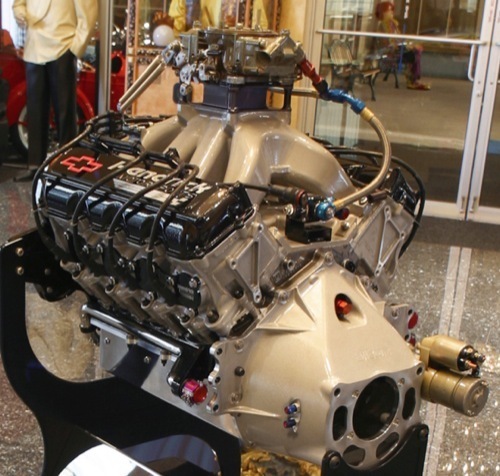 When GM’s 1955 engine architecture wasn’t up to the Toyota challenge, the automaker responded with a whole new design. 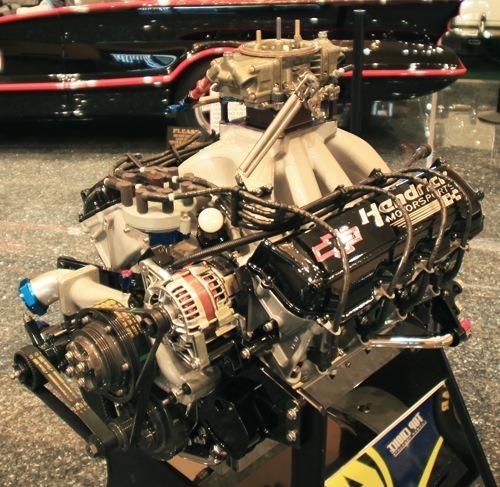 First, GM developed the new Impala SS exclusively for NASCAR Nextel Cup Competition. 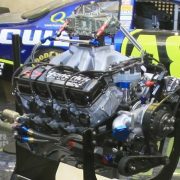 Now, it’s replacing the smallblock, second-generation (SB2) engine, NASCAR’s workhorse since 1998. Besides being more competitive, the new powerplant will be safer, less costly, and more reliable. 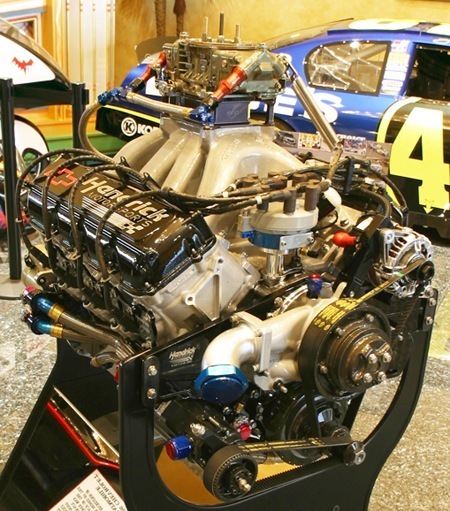 The R07, short for “Racing 2007,” is GM’s first purpose-built NASCAR racing engine. 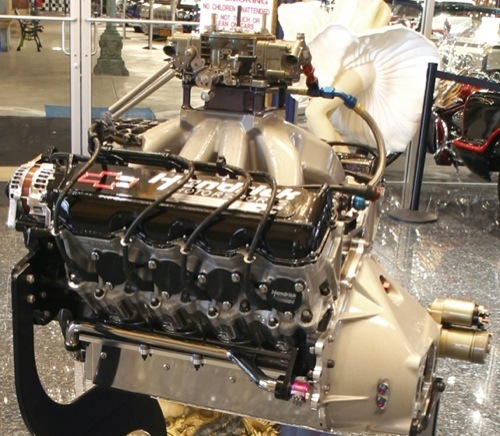 The evolution of the GM racing engine paralleled that of the smallblock V8 production engine, now in its fourth generation. 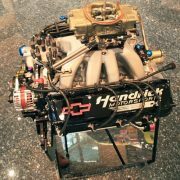 Until now, all of GM’s small-block racing engines have shared key dimensions such as cylinder-bore spacing, camshaft location, and deck height with the original small-block V8 introduced in 1955. 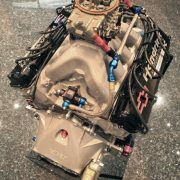 GM Racing supplies the cylinder block, cylinder heads, and intake manifold for the new engine package. It also developed the water pump, rocker covers, valley plate, and front cover. 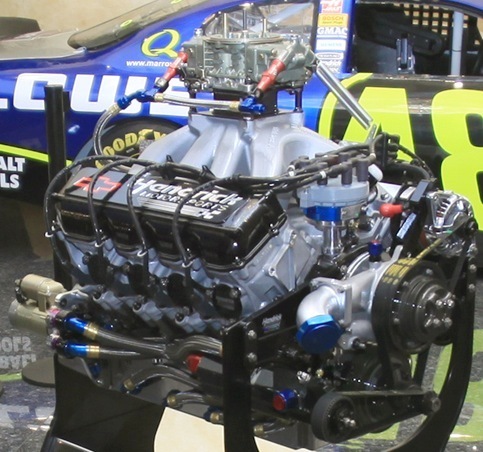 Teams and independent engine builders assemble these components using proprietary parts, including rotating and reciprocating assemblies, valvetrains, oil pumps, and fuel and ignition systems. 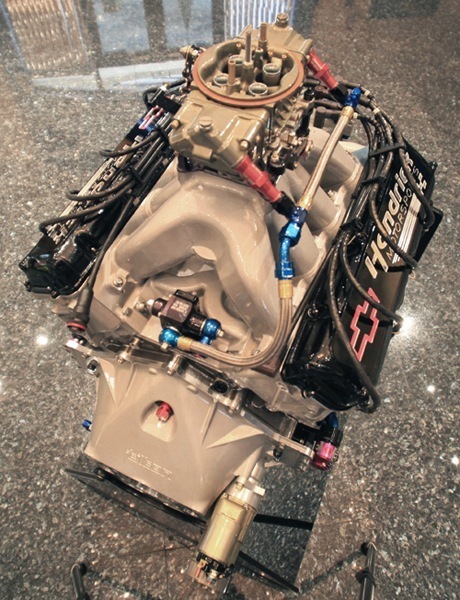 “New manufacturers coming into NASCAR pushed the envelope with engines that had no link to production powerplants, while our engines were based on the 1955 architecture of the first small-block V8,” explains Jim Covey, NASCAR engine development manager for GM Racing. When Toyota came in, it had to develop a new engine because it didn’t have a production twovalve pushrod engine. 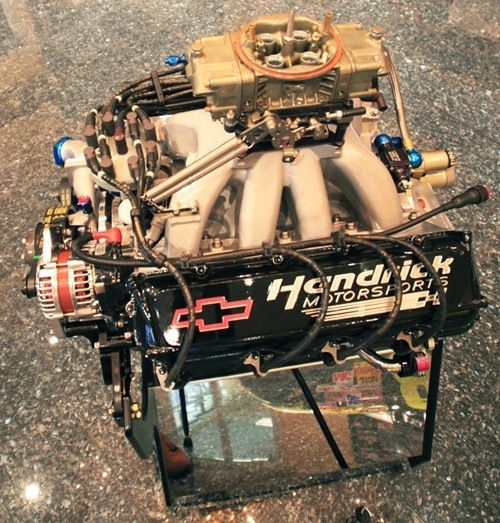 NASCAR Nextel Cup leveled the field with new parameters for all manufacturers, which let Chevy develop the R07. 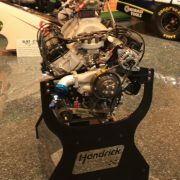 The new engine reflects the last 50 years of advances in racing technology. 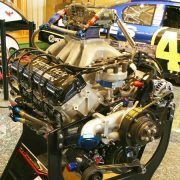 “NASCAR’s parameters for the new generation of engines offer a range of choices on key dimensions and design features. Our job is to carefully balance the trade-offs,” says Pat Suhy, GM Racing Group manager, Oval Track. 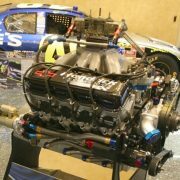 Per NASCAR regulations, the R07 displaces a maximum of 358 cu in. and retains the classic twovalve pushrod design. Some of the key technical advances are 4.500-in. 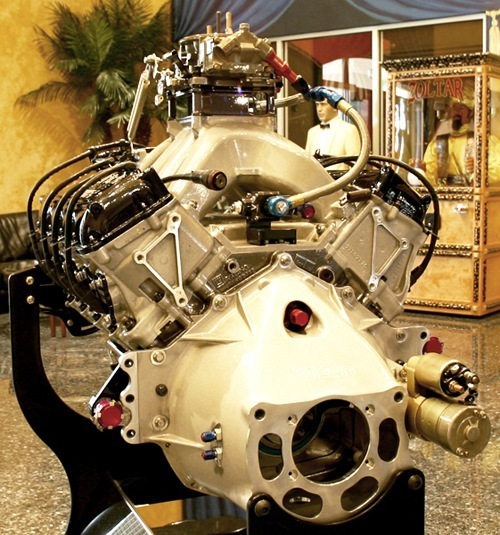 cylinder-bore centers (versus 4.400 in the SB2) that improve coolant flow around the cylinder barrels, a new six-head-bolt pattern that improves the head-gasket seal and reduces cylinder-bore distortion, and a cooling system that reduces heat at critical locations. 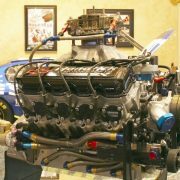 A cast camshaft tunnel, inboard piston squirter galleries, and overhead oilfeed galleries let technicians assemble the engine faster. Relocating the fuel pump and eliminating external oil and coolant lines improved safety. 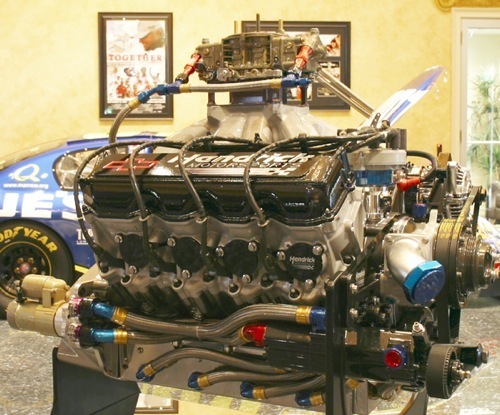 The camshaft in the R07 sits higher in the block than it does in the SB2. 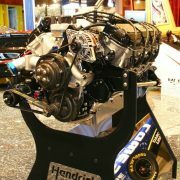 This means shorter and stiffer pushrods and better valvetrain dynamics at high rpm. Tests have shown that raising the cam added around 500 rpm. And raising the cam made room for the inboard piston squirters that cool the underside of the pistons with oil. 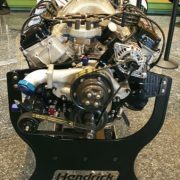 The new engine has provisions for driving a conventional diaphragm fuel pump from the camshaft. 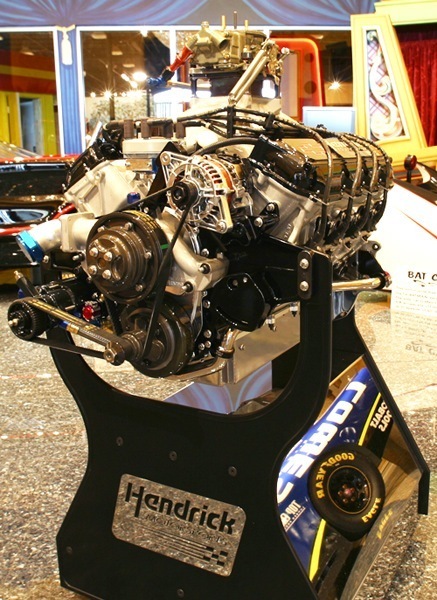 A remote-mounted mechanical fuel pump can be driven by a cable from the rear of the camshaft. This way, the fuel pump can move to the rear of the car, near the fuel cell, where it’s less vulnerable. 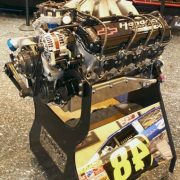 Raising the crankshaft also let the team isolate the camshaft tunnel from the crankcase, thus minimizing windage losses caused by oil falling from the cam onto the rotating crankshaft. Isolating the camshaft tunnel also helps contain valvetrain parts in the event of a failure. And with a dry sump, oil is scavenged from the cam tunnel. The valley plate has coolant passages running through it. The old engines had a coolant passage running through the manifold. This meant mechanics had to drain the coolant before pulling the manifold. 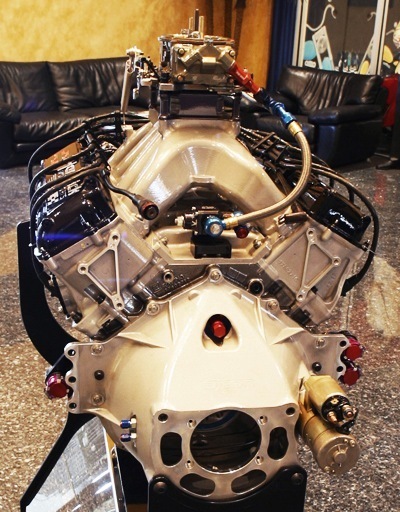 As for the cylinder heads, the R07’s aluminum heads resemble production LS-Series small-block cylinder heads with alternating intake and exhaust valves. This contrasts with the “mirror port” design on the SB2. 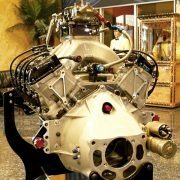 “In the SB2, if you split the cylinder head down the middle, the intake ports from cylinders 1 and 3 point rearward, toward the carburetor. And if you split the head between 3 and 5, the ports from cylinders 5 and 7 point forward, toward the carburetor, like mirror images. With an alternating configuration, you don’t have two exhaust ports right next to each other, generating a huge amount of heat. Though we have alternating valves, we still oriented the intake runners toward a central position so the cylinders in the front tilt toward the back and those in the back tilt frontward. It’s more lineof- sight. 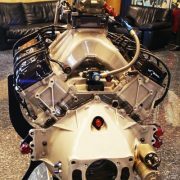 You’re feeding fuel and air at a central point, giving you the straightest shot,” says Covey. The R07’s shallow valve angle and compact combustion chamber produce a 12:1 compression ratio, the maximum mandated by NASCAR. 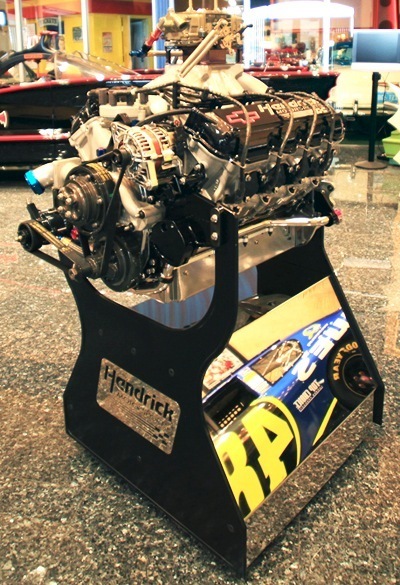 The aluminum intake manifold has an extended plenum. 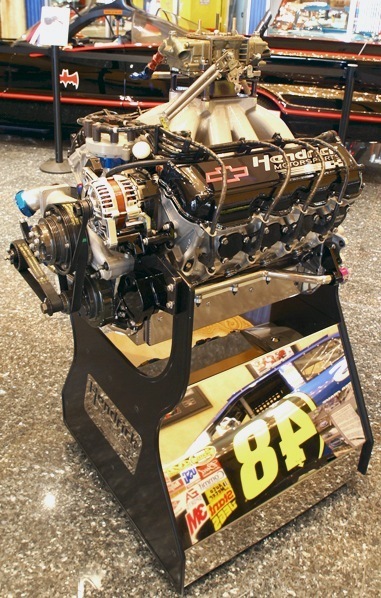 With a small plenum, the end runners (which carry fuel to the individual cylinders) are longer than the center runners. 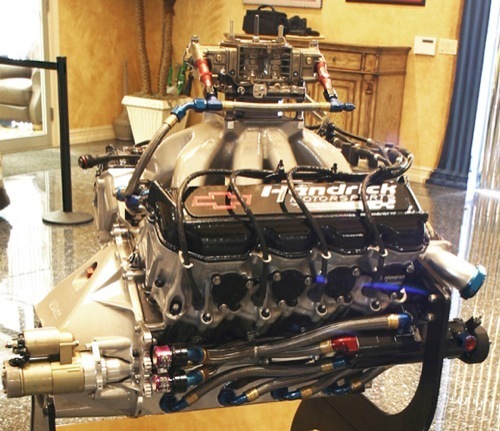 Extending the plenum reduces the length of the end runners, making them more like the center runners. That way, they tune at the same rpm, which improves fuel distribution among the cylinders. The valve springs on the new engine still get oiled. 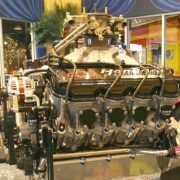 The old SB2 had external lines that ran from an oil gallery in the block up to the cylinder head to cool the valve springs. Now, all passages are internal, eliminating lines hanging off the end of the block. 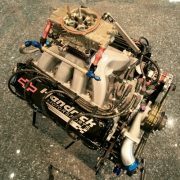 “We’d never done this in a NASCAR engine, but the rules changed significantly when Toyota entered. Before then, everything was production-based. I think NASCAR realized it wasn’t fair to hamper some of the guys, like Chevy with its 1955 architecture, while Toyota came in with something brand new. 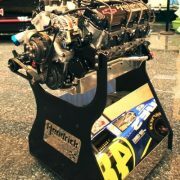 The rocker covers are rigid cast aluminum with O-ring seals. The valve-spring oilers are pressure fed from passages in the cylinder heads. Eliminating external oil lines reduces the likelihood of leakage. 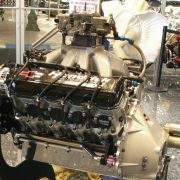 “Given a clean sheet of paper, we integrated those coolant passages or lines into the block and cylinder-head castings. Before (in the SB2), a lot of those oil galleries and other features weren’t there,” says Covey. 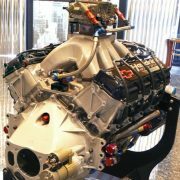 The GM team also designed a high-efficiency water pump and a carbon-fiber front cover that shields the camshaft belt drives. 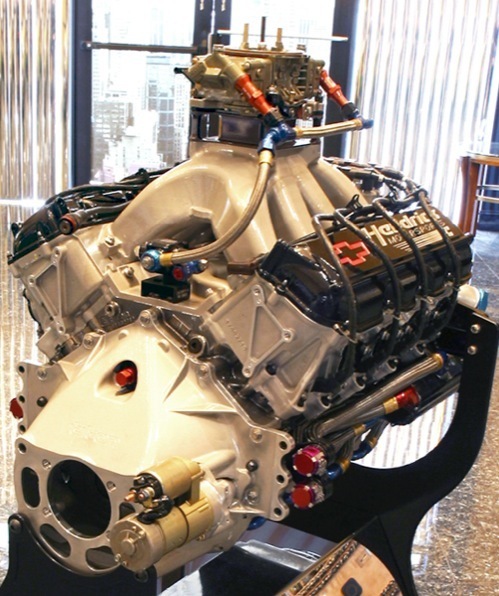 To design the R07, they used many of the same tools used to design production engines, including solid 3D modeling, computer-aided engineering, computational fluid dynamics, and finite-element analysis. 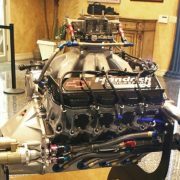 While CFD is often associated with aerodynamic development of race cars, it can also help to analyze the behavior of fluids, like the coolant flowing through the block and cylinder heads. “You want to put the water where the heat is generated, and you want it distributed evenly, to cool the cylinder bores all the way around,” says Covey. But improving design in one area affected other areas. 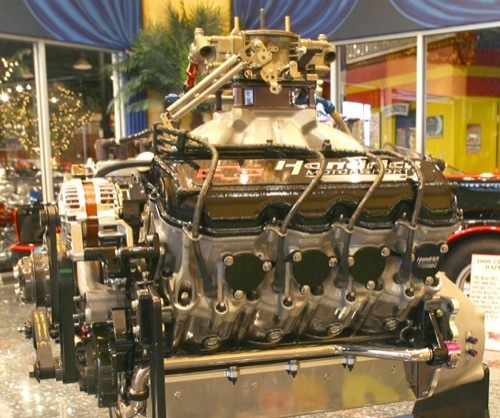 FEA helped the designers analyze the strength while minimizing the weight of the block and cylinder heads. “Putting water between the cylinder bores resulted in thinner cylinder bores. Do you want the cooling or do you want the strength? By spreading the bore centers we got sufficient bore-wall thickness and still brought in water. As for the new head-bolt pattern, the racing team only did what production did years earlier: They separated the head-bolt columns from the bore wall, so when the head bolt is tightened there’s no pulling on the wall. And the sixhead- bolt pattern creates a more even clamp load on the gasket. 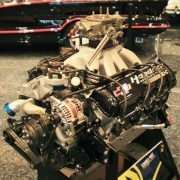 Fast forwarding through five decades of technology should stand GM and Team Chevy in good stead for years to come. 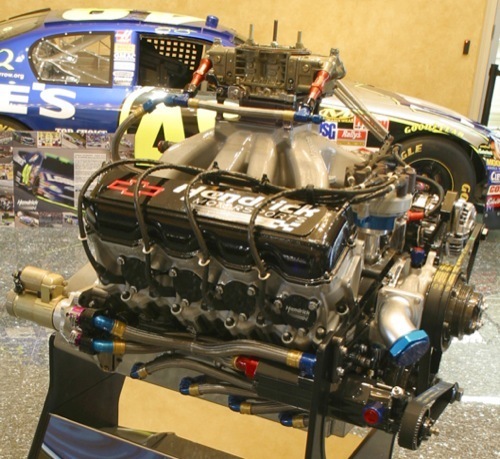 The 5.8-liter V8 R07 NASCAR motor moves Team Chevy ahead 50 years.